Irving Penn is born in Plainfield, New Jersey. Attends the Philadelphia Museum School of Industrial Art. Studies design with Alexey Brodovitch, art director at Harper's Bazaar, and works as his assistant. Penn buys his first camera, a Rolleiflex, with earnings from drawings published in the magazine. Works in New York as an art director at Junior League magazine and at Saks Fifth Avenue. Travels through the American South to Mexico to spend a year painting. Hired at Vogue by art director Alexander Liberman. He encourages Penn to take his first color photograph, a still life, which becomes the October 1 cover. Penn considered this his beginning as a professional photographer. Volunteers with the American Field Service. Back at Vogue, undertakes extensive portrait series of cultural figures. Travels to France, Italy, Spain, and Peru for Vogue. After completing fashion editorial in Lima, prolongs stay to make portraits of local people in a daylight studio in Cuzco. Photographs a series of nudes which he prints using an experimental process of bleaching and redeveloping. Striking fashion photographs by Penn appear in Vogue. Many of these feature the Swedish model, Lisa Fonssagrives. She and Penn marry in London, shortly after the Paris couture collections. For Small Trades series in Paris, London, and New York, photographs workers with their tools and wares in the studio. Begins advertising in addition to editorial work. Moves studio to 80 West 40th Street. Publishes his first book, Moments Preserved. First commercial exhibition of his work at Alexander Iolas Gallery. Continues fashion and portraits for Vogue; begins series of Flowers. Travels for Vogue to Japan and Crete. Beginning of work for Look and Show magazines. Experiments to develop complex method for printing in platinum and palladium metals. Constructs laboratory in barn on Long Island, NY property. Constructs a portable tent studio for travels. January 1967, Dahomey (now Benin). Pursues photographic projects conceived for platinum-palladium process. Cigarettes (1972), exhibited at The Museum of Modern Art, New York in 1975. Street Material (1975), exhibited at The Metropolitan Museum of Art, New York in 1977. Archaeology (1979–80), exhibited at Marlborough Gallery, New York in 1982. "Irving Penn," a retrospective exhibition at The Museum of Modern Art, tours widely in the United States and abroad. Afterwards, Penn resumes painting and drawing in his free time outside a busy studio schedule of editorial and commercial assignments. Begins collaboration with designer Issey Miyake. Travels to Prague and photographs Cranium Architecture series. Penn gifts 120 works to the Smithsonian Institute in Washington, D.C. Joins Pace/MacGill Gallery in New York. "Irving Penn: Master Images," retrospective jointly organized by the National Portrait Gallery and the National Museum of American Art in Washington, D.C. Publishes Passage: A Work Record. Lisa Fonssagrives-Penn dies in New York. Penn's innovative portraits, still life, fashion and beauty photographs continue to appear regularly in Vogue. Pursues a number of personal projects and experiments. Still life work flourishes, returns to flowers and nudes as subjects, pursues complex technical experiments with cameras and printing, in addition to painting, drawing, and printing. Penn travels to Paris to photograph the haute couture collections for the last time. Donates majority of his archives and 130 fine art prints to the Art Institute of Chicago. "Irving Penn: A Career in Photography" retrospective at the Art Institute of Chicago. "Earthly Bodies: Irving Penn Nudes, 1949–50" exhibition at The Metropolitan Museum of Art. Simultaneously, "Dancer: 1999 Nudes" exhibition held at the Whitney Museum of American Art. Publishes A Notebook at Random. Photographs his 165th Vogue cover. 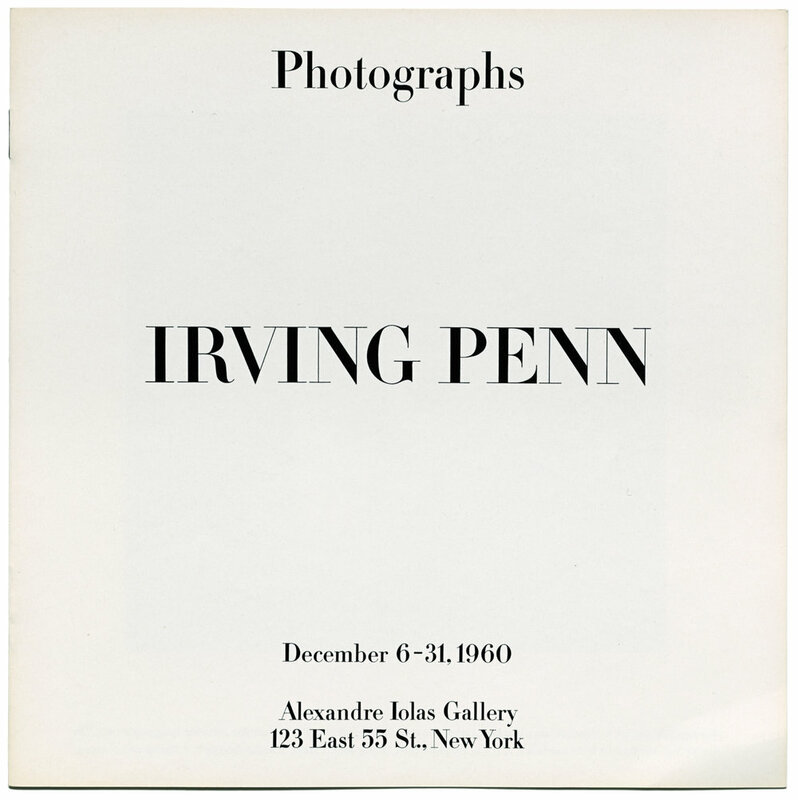 Establishes The Irving Penn Foundation. Returns to flowers as a photographic subject. Irving Penn dies at his home in New York, at the age of 92.